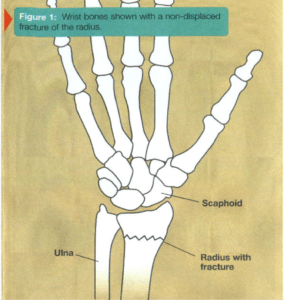 The most commonly broken bone of the wrist is the radius (see Figure 1). 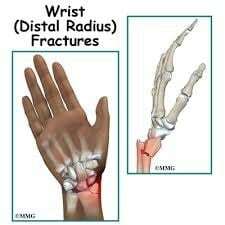 Many people think that a fracture is different from a break, but they are the same. When the wrist is broken, there is pain, swelling, and decreased use of the hand and wrist. Often the wrist appears crooked and deformed. 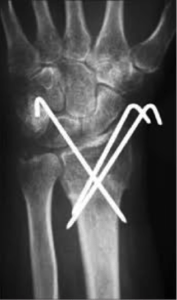 Fractures of the small wrist bones, such as the scaphoid, are unlikely to appear deformed (see Figure 1). Fractures may be simple with the bone pieces aligned and stable. Other fractures are unstable and the bone fragments tend to displace or shift, in which case the wrist is more likely to appear crooked. Some fractures break the normlikely to appear crooked. Some fractures break the normally smooth, ball bearing-like joint surface; others will be near the joint but leave the joint surface intact. Sometimes the bone is shattered into many pieces, which usually makes it unstable. An open (compound) fracture occurs when a bone fragment breaks through the skin. There is some risk of infection with compound fractures. A splint or cast may be used to treat a fracture that is not displaced, or to protect a fracture that has been set. Other fractures may need surgery to properly set the bone and/or to stabilize it. 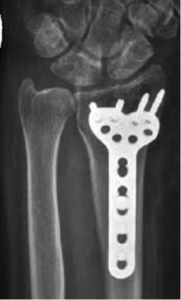 Fractures may be stabilized with pins, screws, plates, rods, or external fixation (see Figure Below). Sometimes arthroscopy is used in the evaluation and treatment of wrist fractures. Your hand surgeon will determine as to which treatment is the most appropriate in your individual case. On occasion, bone may be missing or may be so severely crushed that there is a gap in the bone once it has been re-aligned. In such cases, a bone graft may be necessary. In this procedure, bone is taken from another part of the body to help fill in the defect. Bone from a bone bank or synthetic bone graft substitutes may also be used. While the wrist fracture is healing, it is very important to keep the fingers flexible, provided that there are no other injuries that would require that the fingers be immobilized. Otherwise, the fingers will become stiff, hindering the recovery of hand function. Once the wrist has enough stability, motion exercises may be started for the wrist itself. Your hand surgeon will determine the appropriate timing for these exercises. Hand therapy is often used to help recover flexibility, strength, and function.